I took a flyer on this new place on the outskirts of the Tenderloin the other day. 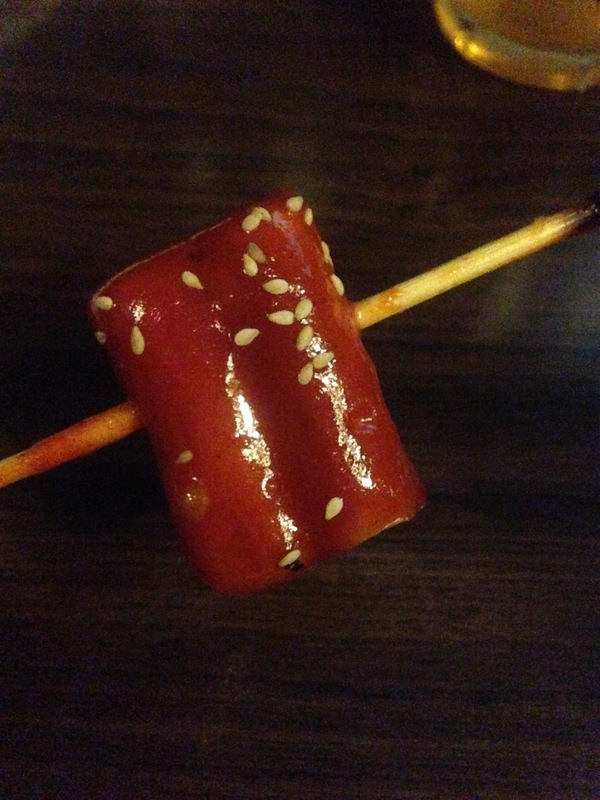 It’s a modern–style Korean snackery/soju bar. It’s somewhat like Toyose in its offerings but a lot more convenient for most of us, I would think. 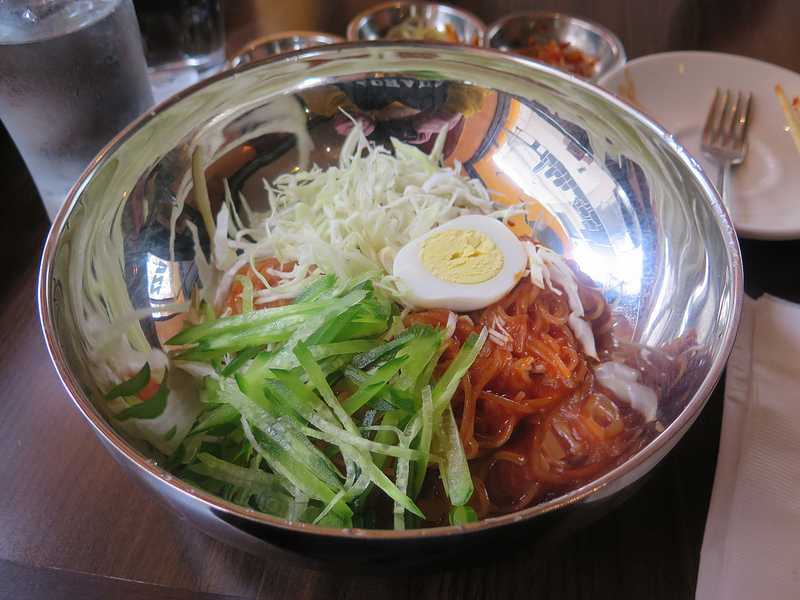 I went for the “Jjol Myeun” (spicy chewy noodles) which were new to me and a very refreshing cold noodle dish. My reactions to the dish can be found in my noodle blog. I’d like to hear opinions from others on the other dishes (Yelp has pictures of the whole menu) as I’m not particularly well grounded in Korean Cuisine. Zzan seemed a little pricey for the area (unless you consider it part of the Theater District). My noodles were $10.95 for a dish that contained little protein other than half a boiled egg, though I suppose you have to factor in the free banchan. Only three small dishes of bachan were delivered to my table but free refills are offered. Haven’t been. The dish looks tasty, but overpriced. The price is definitely on the high side, for a simple dish like this. This kind of cold noodle dish is very popular in Asian cruisin, they are very tasty, simple ingredients, easy to make and good for hot summer days. My hometown has one version, the sauce is based on ginger, garlic, vinegar, and soy sauce, sided with summer squash. I remember in hot summer evenings, every family in our village is eating that. Was the noodle chewy enough to justify the price? For drinks and K-pop videos, it’s fun, but I prefer Toyose or the places on Telegraph in Oakland for food. Nearby Cocobang has a much shorter menu and better food. 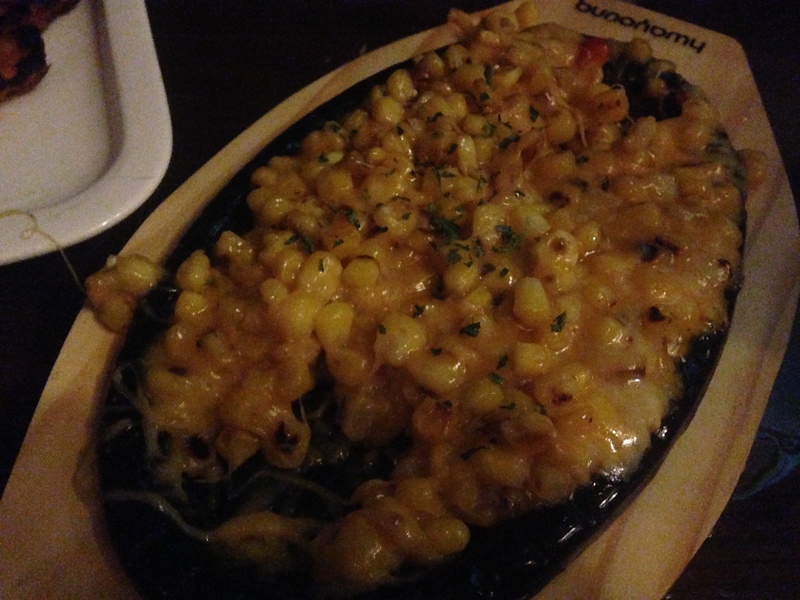 Corn cheese was really good— the corn kernels were browned against the iron plate and there was a good amount of stretchy cheese. Perfect bar snack. I’d recommend the Kim chi pancakes, seafood pancakes, and Rice cakes in a pink sauce with bacon. Rice cake skewers were crispy and good. Shrimp skewers and beef skewers were overcooked. Banchan took a while to come out and had little life in them— I can’t remember a time when I’ve not wanted to request more Kim chi. The skin had soft, flabby parts on the soy garlic chicken wings, and spicy wings. These seemed like basic sauced wings— wasn’t any special treatment, such as having the fat fully rendered out (Fusebox) or tons of sauce, and mystery skin/crunchy bits (Dan Sung Sa). Kalguksu tasted like potato water, and didn’t have the hearty rounded flavors of the one I recently had at Mixed Grain in Walnut Creek. There were instances of noodles stuck together, side to side. A stew seemed like a good choice for our party of 9, and we got the Octopus and bulgogi one. Pretty good. Korean perilla (sesame leaves) added some herbal flavors. We had to ask for scissors to cut up the octopus— the whole thing is cooked on a portable stove in front of us, so user error left some parts overlooked. Cost with beer was $26 per person.